Everyone knows what emergency call is? In short words, these are the calls used in case of emergency ( ICE ) which can be made from lock screen even if phone is locked. By default they are from 2 to 3 digits. Most used ones at international level are 112, 911, 118, 119, 000, 110, 08, and 999. Unfortunately none of them works. Even using any other number except these will result into dialogue box showing "call not sent, this is not emergency number!". So what to do in such situations? The answer to your question lies in this tutorial. Speaking frankly, settings emergency call is as easy as to create new Gmail account. I have posted this tutorial to clear your all mind doubts on this topic including how these can be important and are must to use? How to set them with your own choice number? and last but not least we will talk about on adding medical information. Why Setting Up Emergency Call Is Must? Before you experience the importance of Emergency calls in your real life, let me tell you few situations where they can be life-giving to you. This situation is similar to giving your phone to someone who doesn't know the Password. Now you will debate with me that, How one can forget password? So let me tell you, we are humans and not machine. Sometimes in hard situations our brain doesn't work. Now for an instance, let's think that you ( or maybe someone having your phone ) needs to call and your phone is locked. Moreover you doesn't know the password. In such kind of situations, where you need your phone most, if somehow doesn't work than it's useless. So settings emergency calls to your loved ones can be helpful in your hard time. This is why most of the people use them. Even this is the main reason why android provide this feature. If you are having some serious health related problems like heart attack, Kidney pain etc., than setting emergency call to your personal doctor can be very helpful. For Instance, If somehow you are feeling unconscious in public place, then using this feature, people around you can contact your doctor which is again life-giving to you. Moreover they can contact your family members also. There are two terms - stealing and lost. In Stealing, thief cuts your pocket to steal something. On the other hand lost is self-made mistake. If you lost your android phone in public place by a mistake and someone find it than setting emergency calls and owner info may be helpful for him to contact you and there may be some possibility that you will get it back, if it is kind-hearted. Main work starts from here. 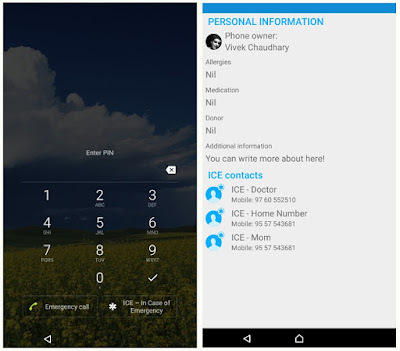 Now follow these steps to set custom ICE call in your android device. I am using Sony Xperia C3 dual with 5.0.2 lollipop version. 2. Find and click "ICE - In Case of Emergency" option. If it isn't available there, than move to groups. 3. 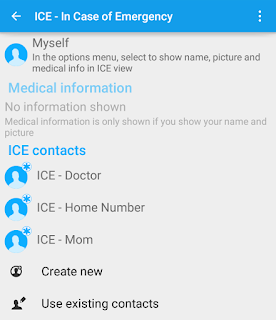 Under ICE Contacts, either create new or choose from existing one. You can add your family member, doctor or trusted friend number. 4. This time we'll enable calling feature in ICE. Simply click option menu button ( 3 dots or use external touch button ) and select "Settings". 5. From the next window, tick mark both buttons as "ICE in lock screen" and "Enable Calling in ICE"
Yippee! You have successfully created it. What Is Medical Information? How to Add It? 1. After this click option menu button ( 3 dots or external touch button ). Now tick mark, "show personal information"
2. From the same menu, click "edit medical info". Now fill out all boxes with appropriate answer. 3. At last hit "Done" button. Finally everything is done. 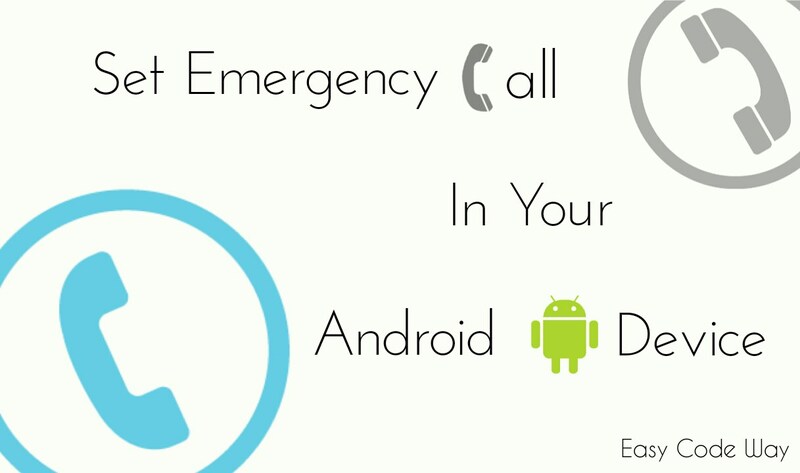 Simply lock your android phone and under lock pattern screen you will find 2 options as "Emergency call" and "ICE - in Case of Emergency". Go with second one and a new window will appear showing your ICE - Contacts after Personal Information. Preview of both screens is shown below. One more term related to this is adding owner info which will be helpful as in #3rd situation. To add it, go to your android settings and click "security". Now under screen security, select "owner info" and write message ( contact information ) you want to add. This message will be displayed on lock screen. 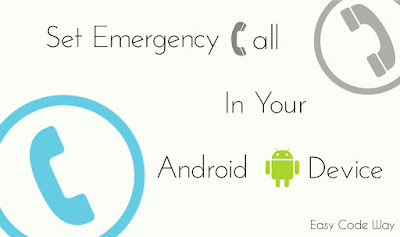 So this is all about on How to Add Emergency Number on your Android Phone. Isn't that easy? Yeah pretty sure about this. Hope it works for you. Please let me know what did you think about this. What are more helpful situations did you find? How to set emergency number on k4 note?